Former Major League Baseball player Tracy Jones (left) and Mark Williams (right) talk on Tuesday evening before the start of the Cincinnati Reds’ HOF Portsmouth Chapter meeting at Buffalo Wild Wings in Portsmouth. As a whole, Tracy Jones’ stay in the major leagues may have been more brief than he would’ve liked as a whole. However, the former Cincinnati Reds’ outfielder, who played six seasons with five different teams, certainly has a personality that reflects an individual who has learned a great deal about his time in and around Major League Baseball. And that is arguably more valuable than his overall playing experience. 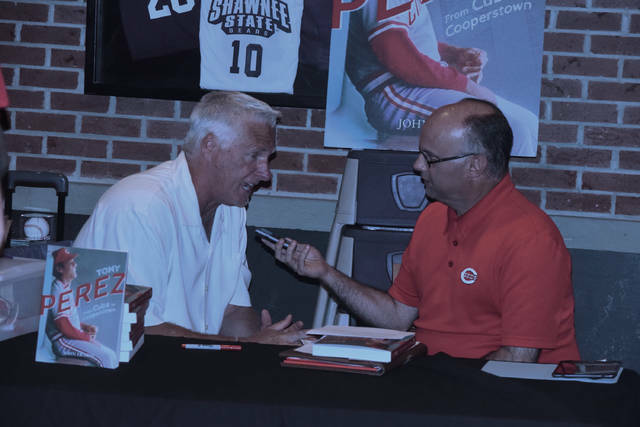 Jones, a 1983 first-round draft choice in the secondary phase of the MLB Draft by the Reds, spoke to individuals from the Portsmouth and Ironton areas, as well as the area encompassing Morehead, Ky., at Buffalo Wild Wings in Portsmouth on Tuesday evening as part of the Cincinnati Reds’ Hall of Fame Portsmouth Chapter meeting. From the outset of the chapter meeting, Jones’ overall humor and the manner in which his stories were told allowed every person in attendance to feel the raw emotions of the years that Jones put in at the highest level of the sport. Like the vast majority of parents, Jones’ excitement about his own playing days were only enhanced by the current play of his own child, Hunter. Tracy, who opened the meeting by saying that he was “off his game” due to watching his son, via his own laptop, strikeout, then pop a flyball up in the air on a 3-2 count in his first pair of at-bats with the Harrisburg Senators — the Double A affiliate of the Washington Nationals — on Tuesday evening, opened the session by talking about Hunter, who is in his eighth season in the minor leagues after being drafted in the 11th round of the 2010 draft out of Lakewood High School in Lakewood, Calif., and his appreciation for Hunter’s improved dedication to the game. In the Reds’ system, the elder Jones foray to the major leagues ultimately took just two years before reaching the majors. However, even after hitting in the .360 range during Spring Training in 1986, Jones had to sweat bullets. Jones responded to Rose’s confidence in him with strong play as the outfielder hit .349 and posted an on-base-plus-slugging mark of .860 in 1986, then responded with his best overall season as a major leaguer in 1987 by collecting a .290 batting average and posting career-highs in games played (117), home runs (10), RBI (44), stolen bases (31), and total bases (157), all according to Baseball Reference. At the time Jones made his ascent, Cincinnati began to re-establish itself as a perennial contender in the National League following three consecutive losing seasons from 1982 to 1984. The Reds, who played in the National League West Division from 1969 to 1994, posted four consecutive winning seasons from 1985 to 1988, including two with Jones at the center of the storm in 1986 and 1987, but fell shy of making the playoffs in each season because the divisional winners were the only teams to make the playoffs during that span of play. After being traded away from Cincinnati in 1988, Jones bounced around between Montreal, San Francisco, and Detroit before landing in Seattle, where Jones had the neat experience of playing with Ken Griffey, Jr. — who ended up in Cincinnati from 2000 to 2008 — and Ken Griffey, Sr. — who was an integral part of the Big Red Machine — at the same time. In Jones’ final season in 1991, Seattle posted its first winning season in franchise history (83-79) as the young talent, such as Griffey, Jr., Edgar Martinez, and Alex Cora, among others, came to the forefront. While his playing experiences weren’t exactly what he expected, Jones considers himself a lucky man. Since his playing career ended after the 1991 season, Jones has started his own insurance company, Tracy Jones Financial, and has served as a radio personality in the Cincinnati area for nearly a decade in multiple facets. His comfortable life today, however, hasn’t stopped Jones from staying around and observing the game that he loves. In addition to Jones, John Erardi, a two-time Ohio Associated Press Sportswriter of the Year, also spoke to the crowd in attendance. His newest book, Tony Perez: From Cuba to Cooperstown, was on sale at the chapter meeting, and marked the seventh published book of his career.